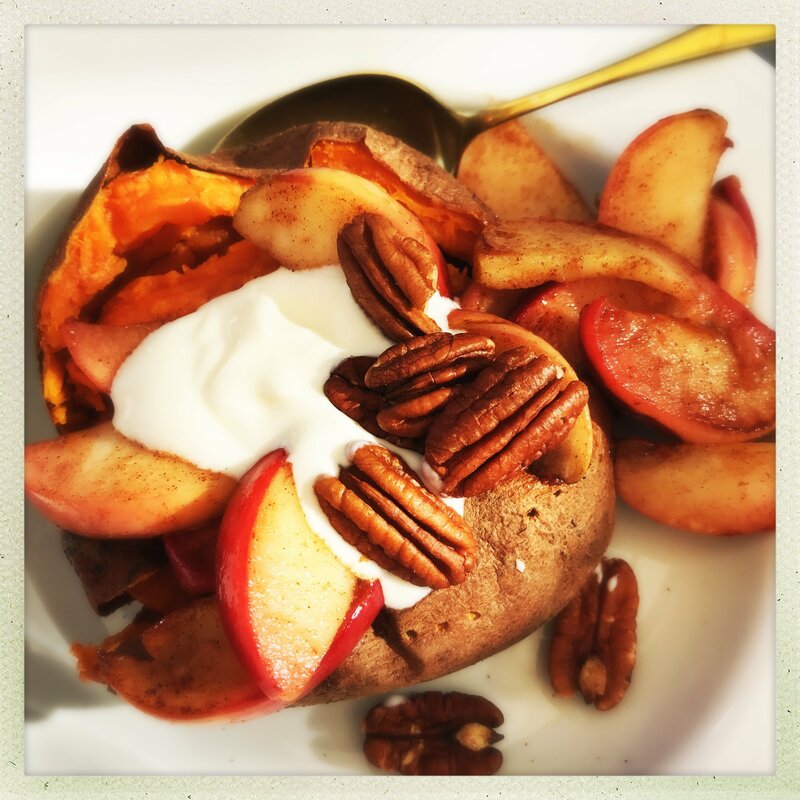 Now we all know baked sweet potatoes are totally delicious filled with cheese, tuna or chilli con carne but stuffing your fluffy, warm baked sweet potato with cinnamon spiced caramelised apples, pecans and a spoonful of creamy Greek yogurt just takes them to another level! These baked sweet potatoes are totally delicious for breakfast or as a dessert and best of all they pack in 2 of your 5 a day. Healthy, tasty and really easy to make, they really are autumn on a plate. Totally delicious and sweet as candy! Scrub and prick the sweet potatoes, bake in the oven for around 1 hour, you can reduce the cooking time by microwaving them for 5 minutes and then just crisping up the skins in the oven. Once the potatoes are cooked remove them from the oven, then start the caramelised apples. Melt the butter in a non-stick frying pan, quarter and core the apples and slice into the sizzling butter. Give them a quick stir and then drizzle over the honey and sprinkle over the cinnamon. Continue to gently stir them until they're just softening and turning sticky. 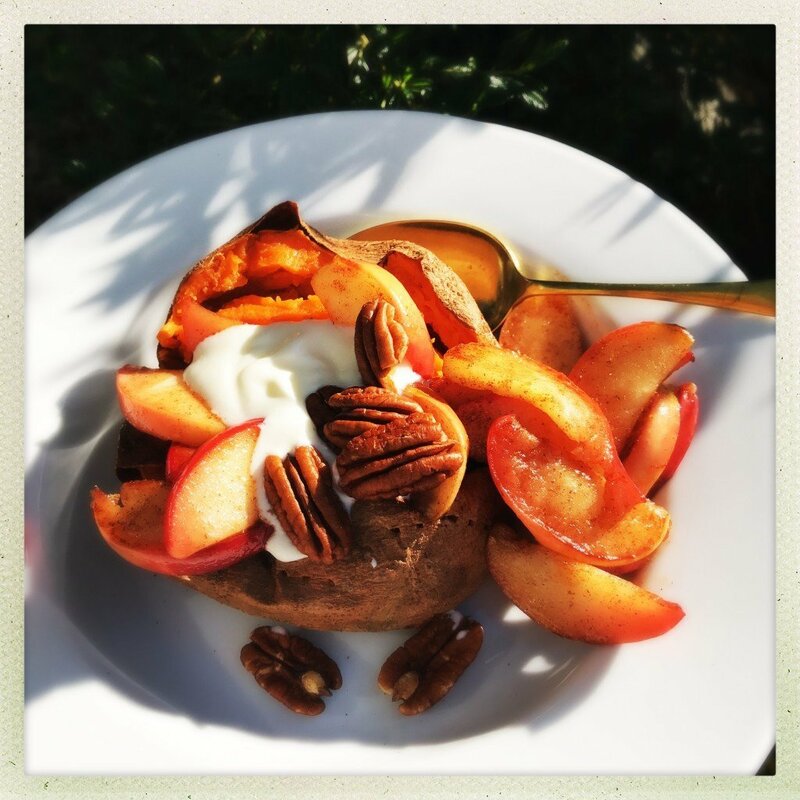 Split open the sweet potatoes, tip in the cinnamon apples, add a spoonful of Greek yogurt and scatter over the pecans. Switch the Greek yogurt for a good vanilla ice-cream. Use plums instead of apples, or a mix of both. Try different nuts – hazelnuts or flaked almonds would work well. Delicious for breakfast or brunch. Serve up at bonfire parties.